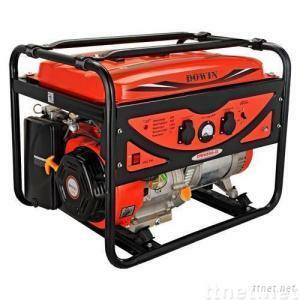 Please visit our website and download the DOWIN Gasoline Generator Catalogue 2011 (868KB) at CONTACT US / Catalogues Download. REFERNCE FEATURES *Ranging from 0.8kw to 20kw. *Rated frequency 50Hz or 60Hz and rated voltage 110V /120V/220V/240V/380V. *Four-stroke powerful engine. *Powered by gasoline, LPG and CNG. *Single-phase or three-phase. *Hand recoil start or electric key start with maintenance-free battery *Copper wiring AC alternator with lower T.H.D. output. *AVR-automatic voltage regulator. *Circuit breaker with thermal protector. *Low tone muffler. *Automatic low oil shut-down protector. *Hour meter with maintenance resets. *Volt-meter, ampage meter, frequency meter. *Overload protection. *Large steel fuel tank. *Never-flat wheels and a high leverage handle for easy mobility. WILDLY APPLICATION FOR Tool power on the jobsite or complete home backup power. Keep the lights on, the water hot, the fridge cold and the TV tuned in. Great for residential applications and for homeowners seeking a reliable backup electric power generator. SPECIAL NOTE DOWIN SOURCING GROUP reserves the rights to improve the parameters and change the appearances without prior notice.